Microsoft has launched Outlook Premium in a public preview, and anyone resident in the United States can now sign up to try it. As an added sweetener, early adopters are being offered Outlook Premium at a reduced price for the first 12 months. Outlook Premium, or Outlook.com Premium to give it its full title, is a premium version of Microsoft’s free email service. It removes all advertising, adds advanced sharing options, and offers support for custom domains with up to five personalized email addresses. We first heard about Outlook Premium in February 2016, when Microsoft started piloting it on the quiet. Then in April Microsoft began sending out invites to participate in the Outlook Premium beta test Microsoft Trials Outlook Premium, Google Apologizes for April Fool... [Tech News Digest] Microsoft Trials Outlook Premium, Google Apologizes for April Fool... [Tech News Digest] Microsoft trials Outlook Premium, Google regrets foolish Gmail feature, the "Internet" is set to become the "internet," turn yourself into a Powerpuff Girl, and Taylor Swift falls off a treadmill advertising Apple Music. Read More . Now, as spotted by ZDNet, Outlook Premium is available as a public preview. 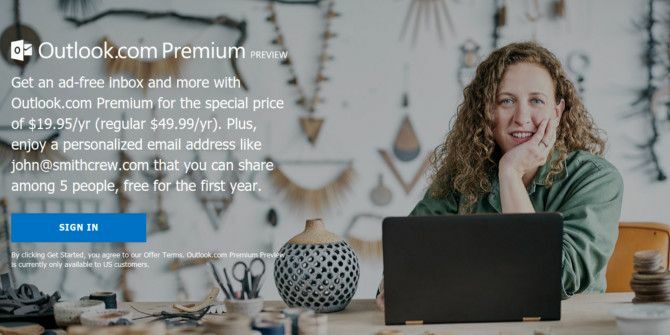 Outlook Premium is currently open to anyone in the US, and is being offered at $19.95-per-year. The regular price once this promotional phase comes to an end will be $49.99-per-year. Coincidentally, the existing Ad-Free Outlook is currently priced at $19.95-per-year, so anyone paying for that may as well upgrade to Outlook Premium for the same price. As Outlook users already have an ad-free option, the main draw of Outlook Premium has to be the support for custom domains Considering A Personal Domain? Here Are Some Cool Uses For It Considering A Personal Domain? Here Are Some Cool Uses For It Even if you’re not a fan of blogging and don’t have an amazing new website to launch, a personal domain can be an awesome tool to own for fun or self promotion: from a customized... Read More . On this score, you can either use a domain you already own, or select a brand new domain at the time of registering. If you select a new domain, Microsoft will buy that domain on your behalf. However, Microsoft will retain ownership of the domain, and only let you use it for a personalized email address as long as you keep renewing your Outlook Premium subscription. According to the Outlook Premium FAQ, “a personalized email address with a custom domain is included for free for the first year”. After that, there will be “an additional charge per year for your custom domain, if you select a new domain during the registration process”. Will you be upgrading to Outlook Premium? If so, is the lure of no adverts or support for custom domains your main reason for upgrading? Were you involved in the beta test? If so, how would you rate the Outlook Premium experience? Please let us know in the comments below! Explore more about: Domain Name, Microsoft, Microsoft Outlook.